Pakistan President Pervez Musharraf has said that Sarabjit Singh was involved in the bomb blasts that killed 14 persons across three Pakistani cities in 1990. He said he was looking into the legal aspect of the case. The stalemate over the Khurana issue continued for the third consecutive day today despite the expelled leader expressing his willingness to work under Mr L.K. 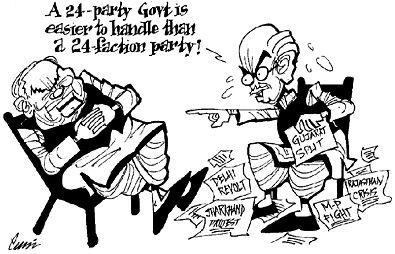 Advani, saying that his problem was only with the younger set of leaders trying to replace the old guard. According to party insiders, an amicable solution could not be worked out today. Shouldn’t the ultimatum given by sarvkhap and sarvjatiya panchayat be ignored by the Haryana Government? Five soldiers were killed and seven others injured when militants ambushed a Jammu-bound convoy of the Army at Awantipora, 30 km from here, on the Srinagar- Jammu national highway. 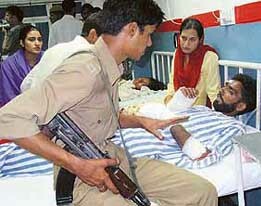 OPINIONS: Punjab the ‘best’ state! — Really? I have to take a decision in a deliberate manner. Otherwise I am a man who shows mercy. Four British rafters who had come on a private tour to Himachal Pradesh and were at Rampur in Shimla district helped the Army in retrieving the body of a jawan from the Sutlej that was spotted near Tanglik yesterday. Three persons, including a woman and a child, were killed and nine injured in separate incidents as heavy rain lashed the metropolis through the night, forcing evacuation of over 500 families from low-lying areas. While the heavy rain in various parts of Punjab in the past 48 hours has provided the much sought after relief to the Punjab State Electricity Board, which was grappling with the problem of power crisis for the past several days, fortunately, it has not caused any noticeable damage to the kharif crop anywhere in the state.